The lands of Persia was ruled by the Sasanian Dynasty from 224 to 651 AD. It was a dynasty that not only promoted art, music and creativity; but also a dynasty that was renowned for its military skill and strategies, excellent foreign relations strategies and ceremonies at the royal court. The dynasty enjoyed favourable relations with China and India because all of them benefited and relied on the Silk Road for their economic growth and maintenance and naturally these cultures influenced each other’s arts. 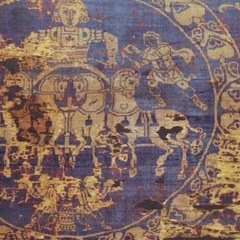 The Sasanian dynasty was well known for its silk textiles produced with very fine images and one of the images that would stand out above any other is the pear roundel design. It was a repetition of medallions encircled with a border of 20 pearl shapes. It generally had two figures (mainly griffins or winged lions) inside mirroring each other with a tree of life dividing the two halves. In the Sasanian Empire, where Zoroastriasm was the main religion, this symbol were of high significance because the medallion represented the sun image as a statement to One God (the ring of pearls symbolizes light radiated by the sun). The griffins or winged lions was a symbols of protection and regal power, or to be chosen by God. The tree of life is one of the major symbols in both Eastern and Western art. It defines the formal and substantial organization of the Universe. In different cultures the tree was understood as a model of the world, it’s centre, a vertical axis of power, and a basis of all vital processes, symbolizing growth, health, happiness, fertility, etc. These textiles with the pearl roundel design became a great and very popular export item for the Sasanids. 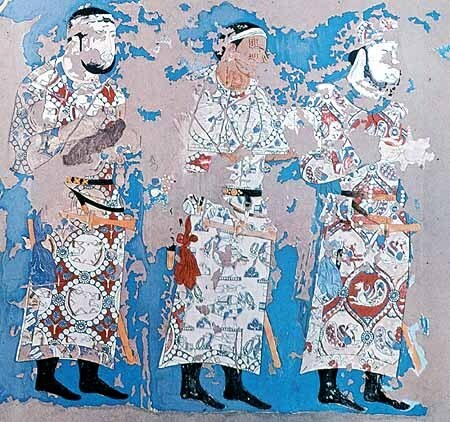 In between the Sasanid dynasty and China lived an Iranian tribe called the Sogdians who became very experienced merchants because they were based on the Silk Road and many goods passed through. They were also expert craftsman and weavers and realizing the popularity of the Sasanid pearl roundel textiles, they too started producing it. Due to their relations with Europeans, they realized that the pearl roundel appeals to all religious dominations, not for religious values but for secular class values. So, they adjusted the design a little to make it more secular and commercial assuring a wider customer base. The lion (without winges) was introduced in the medallion because a lion, the king of beasts, is often used both in the East, and in the West, personifying power and prosperity. It is one of the most used symbols of force throughout thousands years. Wearing clothes with the figure of a lion was understood everywhere as a personification of supreme power and glory. We can assume that the popularity of the lion in European flags and coats of arms, came from this initiative of the Sogdians. So, the Sogdians literally exploited a subject of elitism, stability and power in their fabrics’ decor, playing on the hidden and obvious desires of their powerful trading partners. 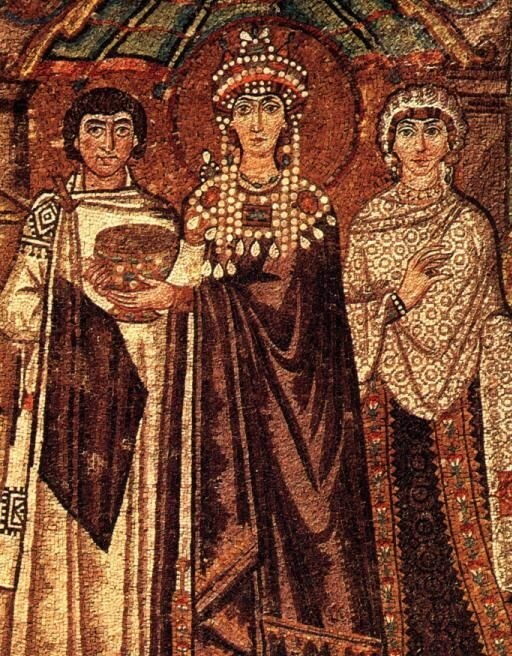 The Christian Byzantine Empire, which had not left yet its "eastern" heritage, willingly adapted Sogdian symbols, transferring them further to the west. The images of predators and signs of power were not simply decor, they were the symbols meant to increase the power of clergy, military and feudal nobility, supporting their political ambitions. Sogdians produced symbols of the epoch that were in great demand and thus were widely distributed in any cultural and confessional environment. 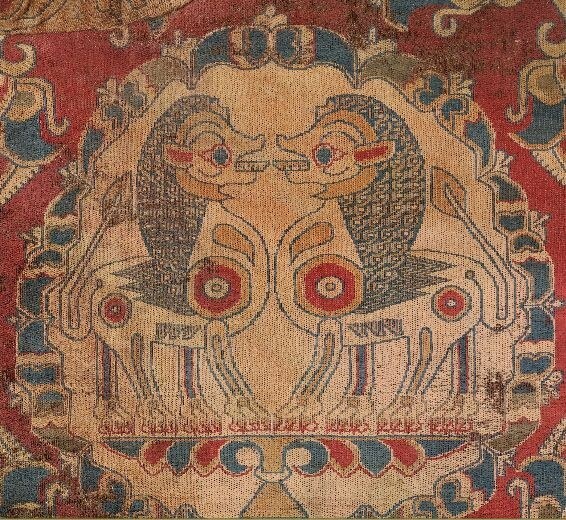 The universality of the Sogdian fabric design made these textiles key factors in symbolizing the political climate of this epoch. It is long known that the symbols woven into Persian carpets each carry with it a certain energy. These energies vary from protection to good health to good fortune to fertility. Used together in one carpet they become a united well-wishing token and the weavers are acutely aware of effect it has and the power it carries. 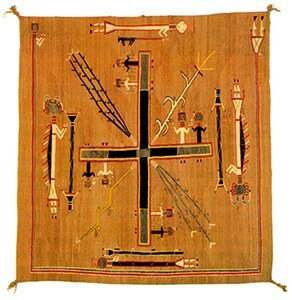 The Navajo in America uses symbols for balancing/healing in their tribe, but instead of weaving it into a carpet they draw the symbols with sand on top of a skin or cloth. The medicine man draws a carpet with symbols of the sand, by letting the sand flow through his fingers in a controlled manner whilst chanting. The sand carpet contains symbols of healing and also of the Holy People. Based on the nature of balancing/healing required the medicine man will determine which symbols to draw and this requires years of training because the Navajo have between 600 to 1,000 different designs to use. The colours for the painting are usually accomplished with naturally coloured sand, crushed gypsum (white), yellow ochre, red sandstone, charcoal and a mixture of charcoal and gypsum (blue). Brown can be made by mixing red and black; red and white make pink. Other colouring agents include corn meal, flower pollen, or powdered roots and bark. The accuracy of the medicine man’s sand carpet design will determine the effectiveness of the balancing/healing that the person wishes to achieve. The person who requires the balancing/healing sits in the middle of the carpet whilst the healing ceremony commences. The sand carpets are not viewed as lifeless drawings, but as living spiritual beings that must be respected greatly. During the balancing/healing ceremony the medicine man and tribe chants to invite the sand carpet (via the symbols in it) to interact with the person and assist with correcting the imbalances present in them. Depending on the severity of the imbalance up to 30 different sand paintings can be done for one balancing/healing and the chanting ceremonies can last for days, in which at least one new sand painting carpet must be drawn daily. 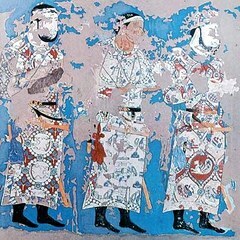 The paintings are destroyed after each ceremony. There are hardly any pictures available of these creations since the Navajo believe that the energies might be disturbed if strangers are allowed and the whole balancing/healing of a person solely depends on achieving the right energy balance. An esteemed Navajo master weaver and medicine man, Hosteen Klah, painted one of his sand carpets, but Navajo traditionalists view it as sacrilege, something to not be seen unless in a balancing/healing ceremony of the Navajo by the Navajo. A carpet was later woven of his painting by Mrs Sam Maurelito. 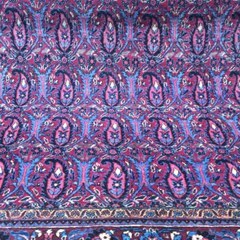 Thomas Whittey, a carpet weaver from Devon, created carpets from 1755 that could match the look and quality of a large Turkish carpet he fell in love with at a London market. Looking more like floor tapestries, the carpets quickly became a “must have” in elite households. But in 1828 a disastrous fire destroyed the weaving looms and seven years later the heir, Samuel Rampson Whitty, was declared bankrupt. A hundred years later a chance meeting on a train between a vicar and another carpet manufacturer, Harry Dutfield, would result in the revival of the once famous Axminster carpets. Learning that no carpets have been made in Axminster since the terrible fire and having had difficulties with his own carpet business in Kidderminster due to the Depression and Unions, Dutfield secured land leases in Axminster to build a new factor, but after World War II raw materials were scares, so Dutfield bought a woollen mill at Buckfast that enabled him to establish the company on its original basis, being the complete "from fleece to floor" carpet maker. The company has had a few famous purchases over the years: The company produced Axminster carpets for: the music room of the Royal Pavilion, Brighton; Chatsworth House; Powderham Castle; Saltram House; and Warwick Castle. 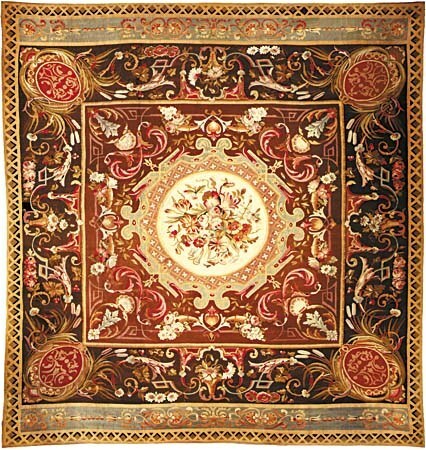 King George III and Queen Charlotte of Mecklenburg-Strelitz purchased Axminster carpets and also visited the factory. In 1800, the company made a 74-by-52-foot (23 m × 16 m) carpet for Mahmud II, the Sultan of the Ottoman Empire, known today as the most famous Axminster Carpet of all, it was initially placed in the Topkapi Palace but then moved to the Defterdar Palace, where it became the property of Esma Sultan, the daughter of Sultan Mustapha III. To celebrate 250 years of carpet weaving in Axminster, in 2005 a commemorative rug was produced. Paraded by the company's weavers through the town, it was then blessed by the Bishop of Exeter and presented to the Earl of Devon. The carpet is now in Clarence House, the home of Prince Charles. Axminster Heritage Ltd bought the now Grade II listed former original carpet factory in which Thomas Whitty founded the company and wove the first carpets. Also in 2012, Axminster was awarded a Royal Warrant for the supply of goods and services to the Royal Household. Even though new Axminster carpets are produced, it is the antique pieces that are quite collectible and highly sought after items. 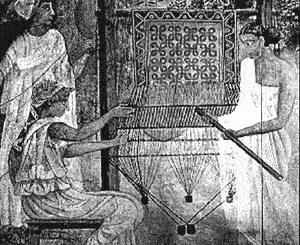 As far back as humankind goes, weaving has been a tool for many things. It was used to create clothing and warm shelter and later on, through the development of the art of weaving, its’ creations became a commodity. Weaving was such an important and integral part of society that the weavers were seen as very important citizens in a community. It is the weavers that became the first record keepers of tribes throughout the ages at a time when writing was not yet available all over the world and art was the only means of expression. The textiles, carpets and other woven items first included geometric shapes that represented the cosmos and the “way of creation”. Later other symbols were added, such as the symbols of specific deities or specific tribes or specific classes, as well as colour. Each colour carried with it a specific meaning and energy and in such a way a lot of unwritten history was recorded . The deciphering of this language requires a translator and unfortunately through many wars and invasions most old textiles found cannot be decoded simply because the civilizations do not exist anymore and there are no other written documents that could help us understand what our ancestors intended with their symbols and colours thousands of years ago. One such fascinating item is the quipu from the Incas. 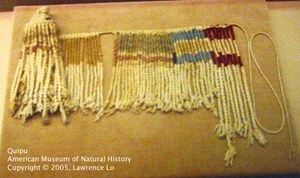 The quipu (meaning 'knot') is a recording device used in Andean civilizations at least as far back as Wari in the 7th century, but it is associated in particular with the administration of the Inca Empire. It consists of a length of rope from which numerous other threads are suspended, some of them with their own subsidiary offshoots. The length of each thread, its colour and the position of any knots in it can acquire specific meanings. Due to the lack of descendants who can understand the quipu we can only speculate what it was used for and how, the most favourable explanation being that it was some kind of accounting and calendar system, but there could be so much more information contained in it that might remain a mystery forever. 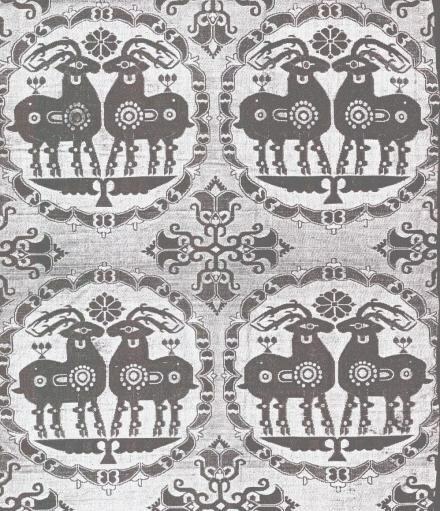 Other textiles produced by the Inca depicted designs that was specific to family groups and one of the reasons for repeated designs, was that textiles were often produced for the state as a tax and so textiles could be representative of specific communities and their cultural heritage. Just as today’s coins and stamps reflect a nation's history, so too Andean textiles offered recognisable motifs which either represented the specific communities making them or the imposed designs of the ruling Inca class ordering them. In Qaxaca, Mexico, the fabrics produced are repeating the ancient Mayan notions of the circle of life, of rebirth, of time and space and of the forces of nature with their designs. The symbols that their ancestors would use are traditionally used in the weaver’s creations, often retaining their original meanings. The diamond that signified the universe now symbolizes the unison of the earth and the skies, snakes symbolize the rich, fertile land, and the toads, also known as musicians in the rain, signify the patron saints. Sometimes there is a butterfly added to the centre of the diamond motif, which symbolizes the sun, the centre of the Mayan universe. Needlework has been around almost as long as humans have clothed themselves. 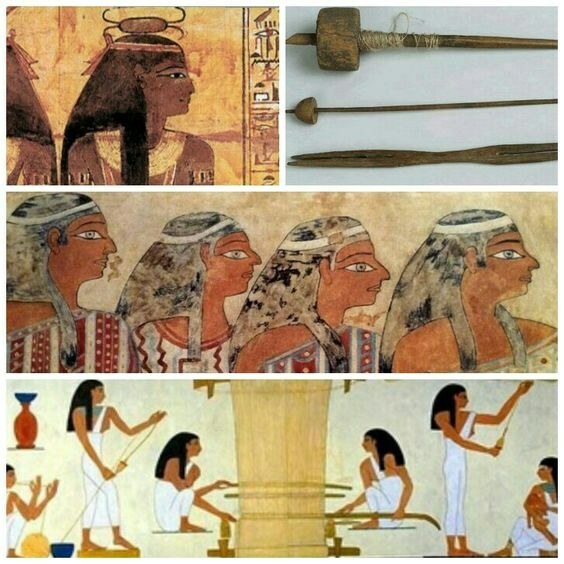 It goes back at least as far as the ancient Egyptians, who used small slanted stitches to sew their tents. Howard Carter, of Tutankhamen fame, found some needlepoint in the cave of a Pharaoh who had lived 1500 years before Christ. Samples of the art have been found on ancient Maori costumes in New Zealand, and the Bible features numerous references to needlework. 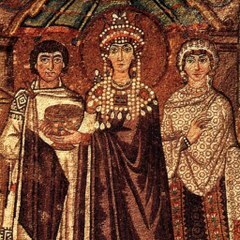 In 13th century Europe, a form of embroidery was done on coarsely woven linen fabric similar to canvas mesh. Tapestries, also popular in the middle-ages, were woven with vertical threads on a loom. By the 16th century, people began to imitate these art forms using a canvas background and the recently invented steel needles that allowed for more intricate work than the fishbone or thorn needles previously available. Needlepoint as it is known today originated in the 17th century, when the fashion for furniture upholstered with embroidered fabrics prompted the development of a more durable material to serve as the embroidery's foundation. The list of historic needlepoint fans includes such famous names as Mary, Queen of Scots (who stitched extensively during her long imprisonment), Marie Antoinette and Queen Elizabeth I. During the reign of these royals, needlepoint was strictly a pastime of the leisure class. As time went on, its appeal gradually broadened to other parts of society. 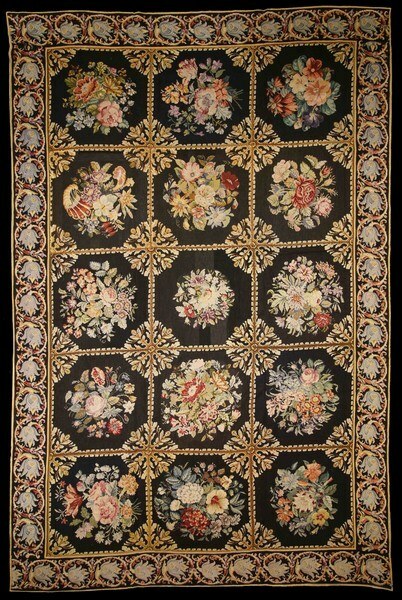 The antique needlepoint in this picture is courtesy of the C John Rare Rugs Collection. The Savonnerie and Aubuson carpets are an entirely French production that replaced Persian carpets in Europe for nearly a century, but how and why? In the 1500’s a group of weavers from Flanders settled in Aubusson and established tapestry weaving known for their exquisite nature and hunting scenes. It was called Aubusson tapestries named after the village it came from. Fast forward to the 1600’s and Europe is gripped with fear. The mighty Ottoman Empire is on their doorstep threatening to invade, the Catholic Church is threatened by the growing Protestant movement and France is practically broke from funding Holy wars and importing goods from the Middle East. All of a sudden the Ottoman Empire starts to crumble bit by bit after another failed attempt to invade Venice and for a moment Europe breathes a sigh of relief knowing that the dreaded invasion seems more unlikely by the day. The Silk Trade Route is still occupied by the Ottomans, so with their new found strength and freedom the European kingdoms set out to find other routes to East, because Europe’s taste for Oriental goods is insatiable. As often happens in times of extreme duress, the arts provide an escape for many and results in the production of some of the best artworks. This is exactly what happened. The Catholic Church realized the “threat” posed by the Protestants and in a bid to retain public support they decided to make Biblical stories and scenes available to the “mostly uneducated” general public in ways they could understand, in a time that art was only in the hands of the church, royalty and the wealthy. They commissioned painters and sculptors to produce new and more dramatic paintings and sculptures with more power, movement and drama than what was ever seen before. This was to be the start of the Baroque art era and from the Church’s lead, the elite and wealthy would follow. The Baroque art flowed into architecture and design and just like that Europe entered a new style era. During that time Pierre DuPont, who obtained the knowledge of weaving a Turkish knot in the Levant, started producing his own carpets in Paris at a fraction of the cost of imported Persian carpets. Kind Henry IV, monarch of France, all too aware of France’s weak financial situation took advantage of this and allowed DuPont to set up his workshop in the Louvre. In so doing he ensured that the wealthy bought “local” and thus French money stayed in France. By the time King Louis XIII became the ruler the popularity of Monsieur DuPont’s carpets had grown, so the king procured a defunct soap factory for DuPont and his apprentice, Simon Lourdet, to set up a larger workshop to produce more carpets. The French word for soap is savon, so the carpets manufactured in the “soap factory” became known as Savonnerie carpets. The business belonged to the King and DuPont had the sole patent rights to produce these French carpets. King Louis XIII, entirely in love with the Baroque art, requested DuPont to change the design of the carpets to Baroque and so the carpet designs included more florals, swirls and curls, darker colours and more elaborate lines. Savonnerie carpets now had an original, proudly French design and so, French carpets became the new craze in Europe. The king offered it as gifts to other kings and the wealthy purchased the rest. 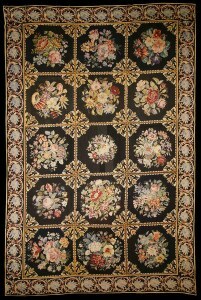 After the death of the king, the elite requested the French carpet weavers to use lighter colours and softer, more natural patterns, which led to the Rococo art era. 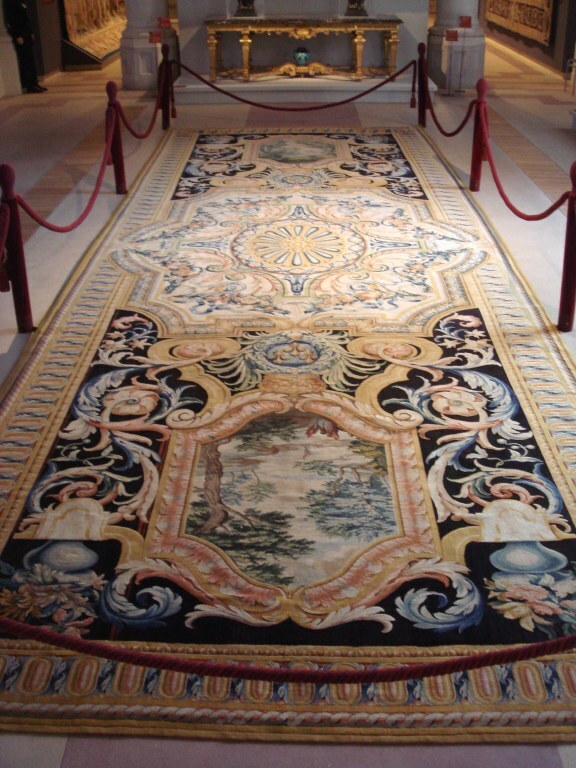 Soon Royal commissions were sent to Aubusson as well for very large tapestries to be woven in the new Rococo style and instead of using it on the walls, it was now also used on the floor as flat weave carpets. Having survived much French upheaval and turmoil, the Savonnerie and Aubusson carpets adapted to the tastes and times, but its gentle demise by the late 19th century, would eventually be caused by the rekindled love affair between Europe and Persian carpets. It is a love affair that has survived to this day, but so too did nostalgia of the once great French carpets and they are now sought after antiques the world over. A wave of retro Savonnerie and Aubusson carpets also started again during the 20th century and these reproductions are once more in the market. The city of Kashan, Iran, was a large and important weaving centre for centuries until the end of the Safavid dynasty in the early 1700’s when it came to a stand still. In the late 1800’s Mohammad Hassan Mohtasham, a textile producer, was asked by some merchants in Tabriz to revive the carpet weaving industry in Kashan. Married to an accomplished weaver from Sultanabad he decided to relocate to Kashan to set up weaving centres. 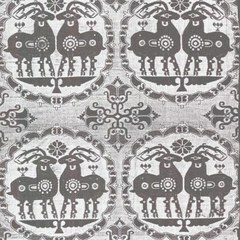 The Mohtasham textiles were produced from Merino wool imported from Manchester, and Mr Mohtasham decided to use the same wool to make carpets with. This decision would prove very successful and important because the high quality of Merino wool allowed a higher knot count for creating detailed motifs with a high pile. Furthermore, Merino wool ages well and appears almost silk like over time. 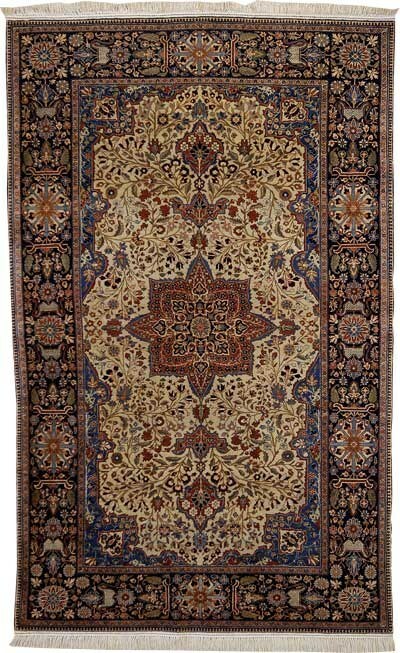 This gave birth to the Mohtasham Kashan carpets that are now sought after collector's items all over the world. He left such an incredible legacy that many carpets from Kashan are now called Mohtasham Kashan, even if they were not woven by his weaving centres. 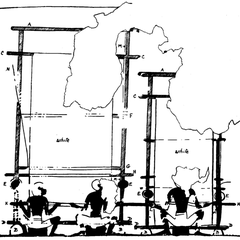 Because of Mr Mohtasham's efforts there were 1,500 active looms in Kashan by 1900 and 4,000 by 1949. 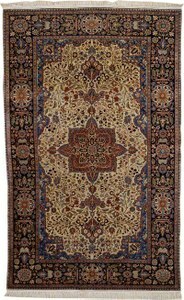 The height of the Mohtasham Kashan carpets woven with Merino wool continued until the Great Depression when the imported wool market crashed. It is only in recent years that the true age of our civilization is really being re-investigated and re-dated. Our 6,000 year old civilization theory is no longer the accepted age and through more and more scientific and archaeological discoveries, we are realizing that our ancestors were not the uneducated, low-skilled people we once thought. Their skill sets are something to be admired and there are many structures they built that we cannot explain or redo in our modern age. One of the skill sets that have survived to this day, however, is weaving. 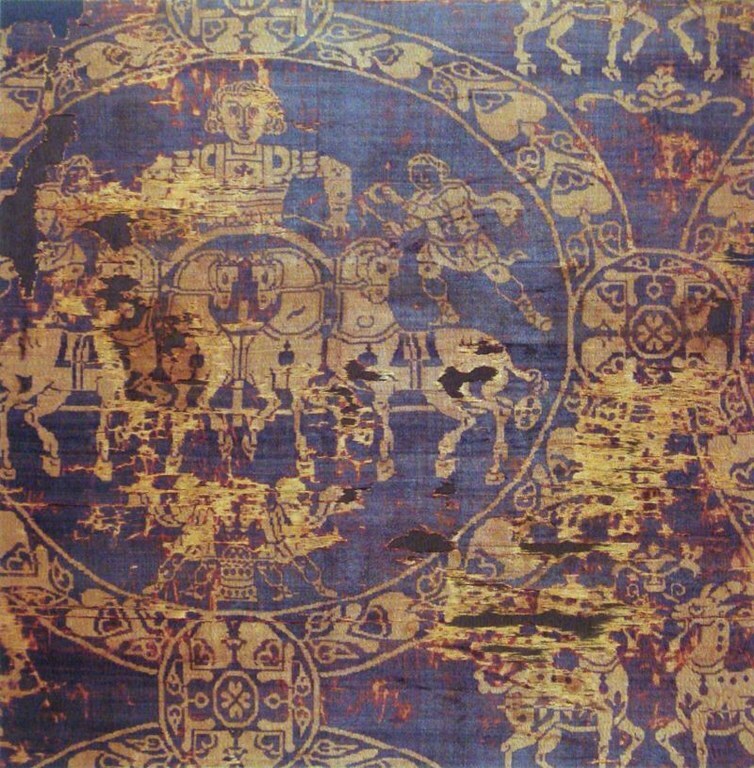 The oldest surviving carpet is the Pazyryck carpet on show in Russia and dates back 2,500 years. But the workmanship and skill that was needed to make this piece indicates that the weaving industry is far older than we can prove at this point. Unfortunately carpets are made from wool which disintegrates over the centuries and thus there are not any other surviving pieces to testify to this statement. We can only go by legends and tales (most of which we now accept as myths) to give us some glimpse of the magnificence and importance of the weaving industry. 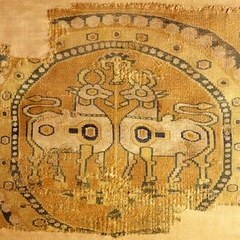 One early carpet, dating from the eighth century BCE, may still be seen in the British Museum - albeit carved in stone on an Assyrian relief - as a precious offering to a king. The stone floors of the seventh century BCE Assyrian palaces - especially at Nineveh and today also in the British Museum - are generally accepted as carpet patterns. Another legendary and magical flying carpet is that of King Solomon. Said to be given to him by God, it could carry 40,000 men at once and fly at the speed of light. 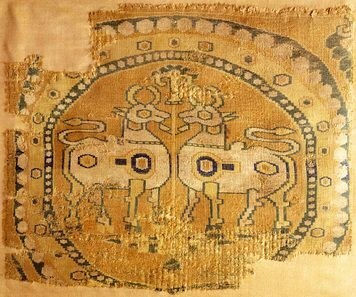 The next great carpet we know of was found in the burial chamber of Cyrus the Great of Persia (559-529 BCE), when 200 years after his death, Alexander the Great crushed the remnants of Cyrus’ empire and, breaking into his tomb, described Cyrus’ golden funeral couch as resting on an exquisite golden carpet. 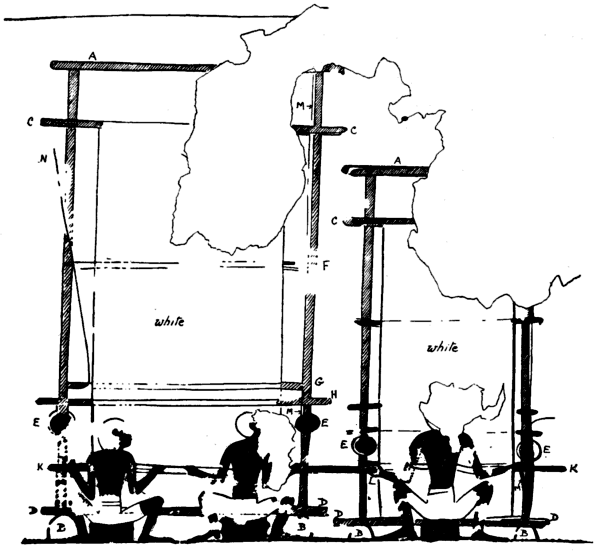 We know from a tablet of perhaps 3000 BCE that the Sumerians had looms. Ur was one of their great cities and the code of Hammarubi of around 1800 BCE records its major export being wool to Babylon. 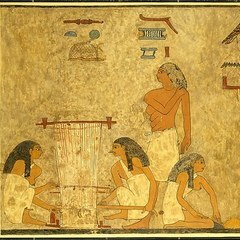 The tombs of Beni Hassan in Egypt (2800 BCE - 2600 BCE) have wall paintings of weavers at work, and there are numerous other Egyptian wall paintings from 2000 BCE that depict looms, showing already highly skilled weavers. Biblical accounts tell the tale of Joseph and his multi-coloured coat as well as detailed instructions as to the materials and the manufacture of every part of the Tabernacle, including how the textiles were to be woven and how they were to be used to build the huge mobile tent to hold the Tablets of the Law during the Israelites wandering in the desert. 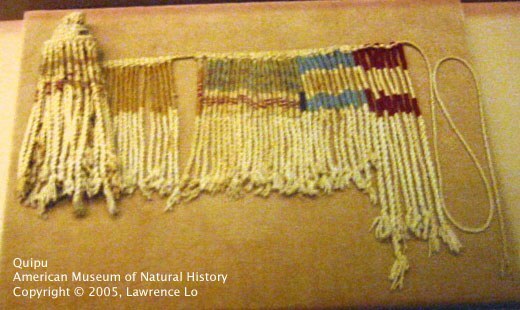 This indicates that the skill of weaving and dying wool in different colours was already an established art form. 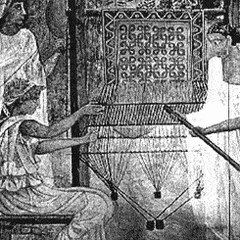 Of course, the precursor to this would have been the development of material by means of weaving. It was a matter of time before the weaving of materials, tents, curtains, bedding and carpets would become a trade and commodity for the earlier weavers, especially through all the conquering and wars that was going on at the time. So next time you look at your Persian carpet, even though it may be new, remember the weavers of thousands of years ago who perfected their craft and passed it on to the next generations in such a way that we can still enjoy the results of their craft and honing their skills. We always say: you can never really own a Persian carpet, you can only become the new treasurer of it until the next generation takes over. 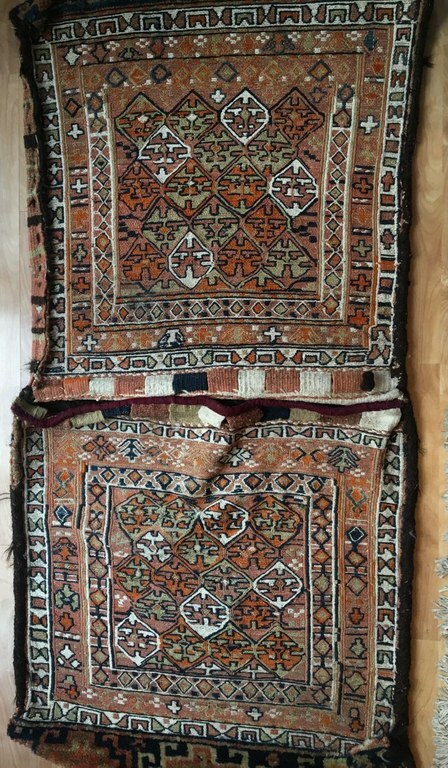 Carpet bags used to be made of Oriental rugs. Carpet was the chosen material because it was a popular domestic accent piece and the "remainder" pieces were easily bought. In a sense, the carpet bag was a sustainable invention because it used remnants of materials which otherwise would have gone unused. Carpet bags sometimes also served as a "railway rug", a common item in the 19th century for warmth in drafty, unheated rail-cars. 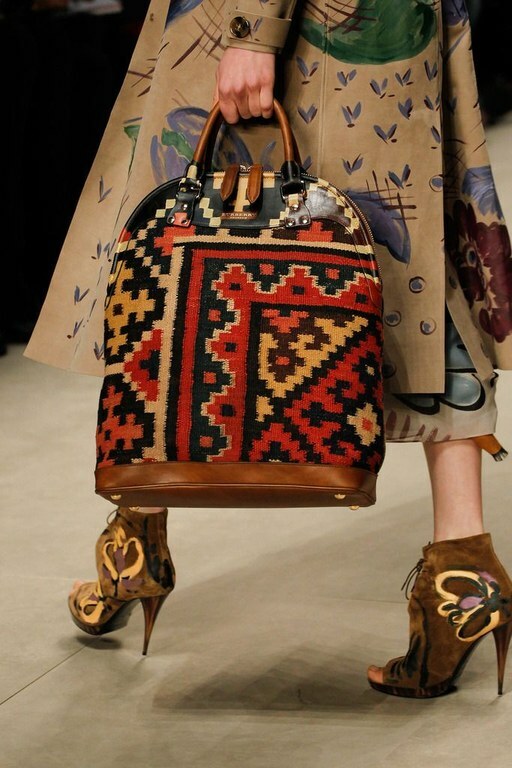 The rug could either be opened as a blanket, or latched up on the sides as a traveling bag. From Robert Louis Stevenson's Travels with a Donkey in the Cévennes (1879): "... my railway-rug, which, being also in the form of a bag, made me a double castle for cold nights." There are many companies still producing carpet bags today keeping this very quirky trend alive! 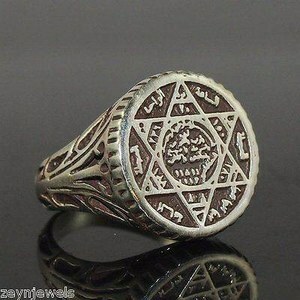 It was Solomon's custom to take off the ring when he was about to wash, and to give it to one of his wives, Amina, to hold. 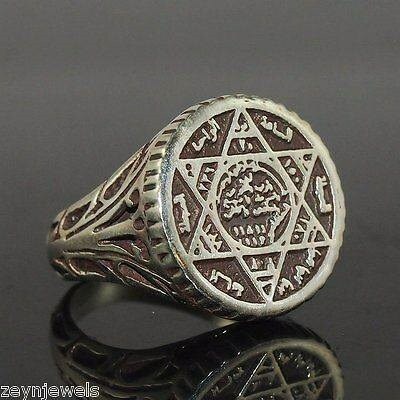 On one occasion, when the ring was in Amina's keeping, the rebellious spirit Sakhr took on Solomon's form and obtained the ring. He then seated himself on the throne and ruled for forty days, during which time the real king wandered about the country, poor and forlorn. On the fortieth day Sakhr dropped the ring into the sea; there it was swallowed by a fish, which was caught by a poor fisherman and given to Solomon for his supper. Solomon cut open the fish, found the ring, and returned to power. Phoenicians and Tyrian purple are inseparable. It is after all the Phoenicians, at around 1,500BC, who became known world-wide for producing purple textiles. Royalty and the elite everywhere could not get enough of this fascinating vibrant colour and as always, demand pushed up the price of purple dye to equal that of its weight in silver. Unlike the other cultures at the time, it was the Phoenician men who were responsible for weaving the textiles and who dominated the trade. Producing this purple dye was no easy task, for at the time it could only be made from the humble sea mollusc who lives 150 meters below surface. More than this, you need 9,000 molluscs to make just 1 gram of purple dye. The dye was made from the colourless liquid in the hypo branchial gland of the mollusc that had to be removed, crushed, soaked with salt and exposed to sun and air for a few days, before being boiled and heated at specific temperatures for a specific time frame. 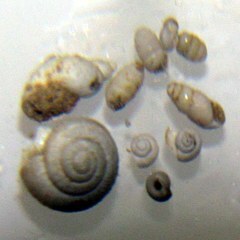 Perhaps it was the near extinction of the molluscs in Tyre that forced the Phoenicians to leave in search of molluscs elsewhere. Finding fragments of rope and textiles dating back to between 12,100 and 11,080 years ago in the Guitarrero Cave in Peru, created great excitement in the world of archaeology and also weaving! It showed not only that the Peruvians were distinguished weavers a very long time ago, but also that weaving was very important to them. In Peruvian society males and females were weavers, but it was the females who drove development and change in their weaving industry. From the usual back-strap weaving method the females started weaving side by side, three at a time, that enabled them to weave wider pieces of textiles around 3,000 years ago. They also started using the wool of llamas and alpaca and introduced embroidered symbols and patterns on their garments. The jaguar-god, Chavin, was a favourite motif. The Peruvian weavers made their dyes from plants, minerals, insects and also molluscs, that as we now know, produce purple dye. At the base of the Děvín Mountain in Czech Republic, close to the Dolní Věstonice village, an Upper Paleolithic site has been excavated since 1924 revealing not only burials of 27,000 to 20,000BC, but many artefacts that included many pieces of art. Amongst the artefacts were traces of textiles from imprints in clay and burned remnants of cloth. It appears, according to the find, that the weavers manufactured a variety of cordages, plaited basketry and sophisticated twined and plain woven cloth. An interesting find amongst all these items were empty mollusc shells that is thought to be from the Dyje river close to the site. 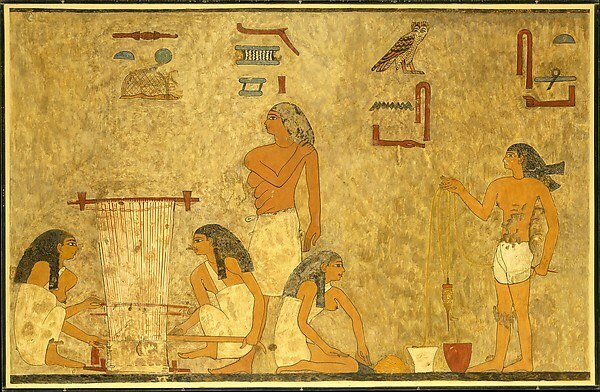 Thus we can assume that these weavers discovered the secret of purple dye long before the Phoenicians. Luckily towards the late 1800’s synthetic purple dyes were created and it was no longer necessary to use the molluscs and purple is still as mystical today as when Tyres fell in love with it. 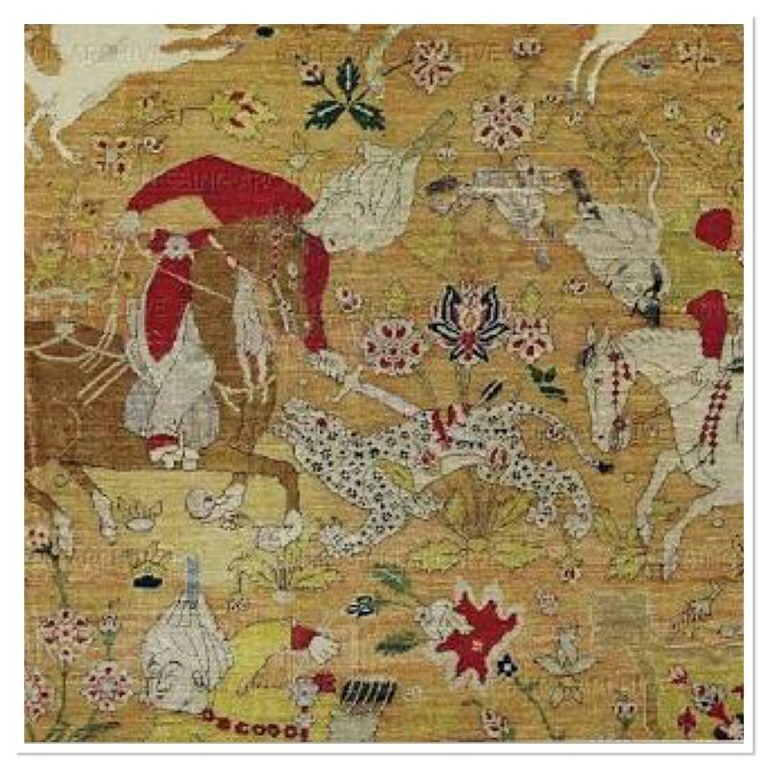 In the Vienna Museum für angewandte Kunst is an exquisite hunting carpet dating from the 16th century. This fine silk carpet with golden background is a wonderful testament to the extraordinary craftsmanship during the Safavid Dynasty in Iran. Another fine example from the same era is the hunting carpet in the Poldi Pezzoli Museum in Milan. 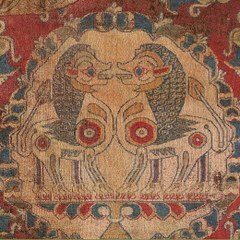 It is one of the rare carpets that is dated in an inscription that says: “It is by the efforts of Giyath-ud-Din ʿJami that this renowned carpet was brought to such perfection in the year (1542 AD)"; and is thus historically significant. Archeaological finds date the domestication of horses to around 3,500BCE in the Eurasian Steppes and Kazakhstan, but a beautiful cave painting of horses found in Lascaux, France, dating to 17,000 BPE, might suggest a much earlier time that humans and horses lived closely together. 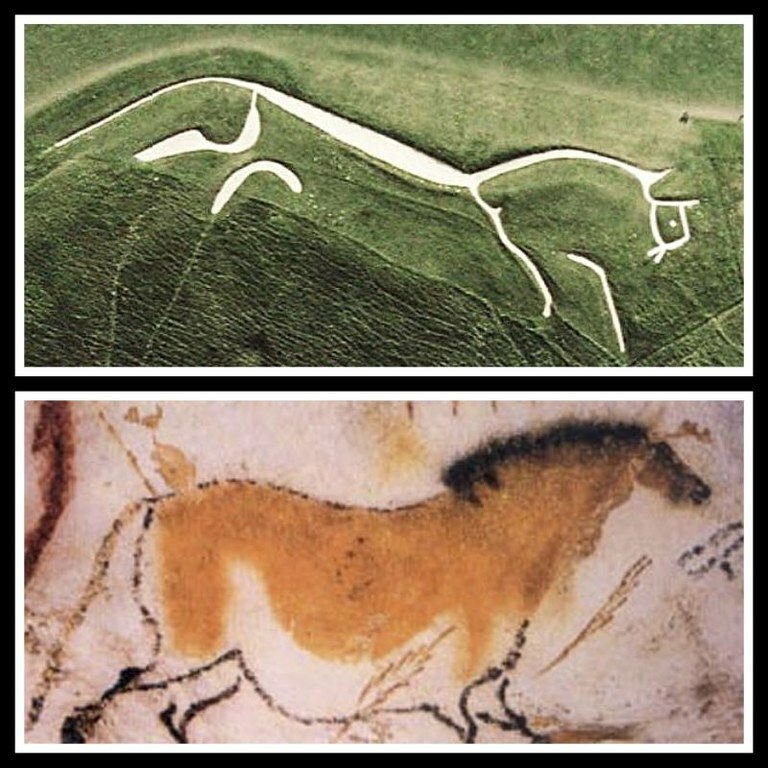 Another great depiction of a horse dating from the late Bronze Age is the Uffington White Horse situated on the upper slopes of the White Horse Hill in the English civil parish of Uffington and is about 110 m long formed from deep trenches filled with crushed white chalk. Throughout our history horses have played a pivotal role in our societies from being the main form of transportation to being an animal that we can play with. It is no wonder that we immortalized them in our arts and crafts. The dressing of horses were as important as the dressing of their owners and great craftsmanship were employed to make/weave unbelievable horse blankets and saddlebags for the horses. No expense was spared to ensure that the horses were dressed up from head to tail in the most elaborate of ways. 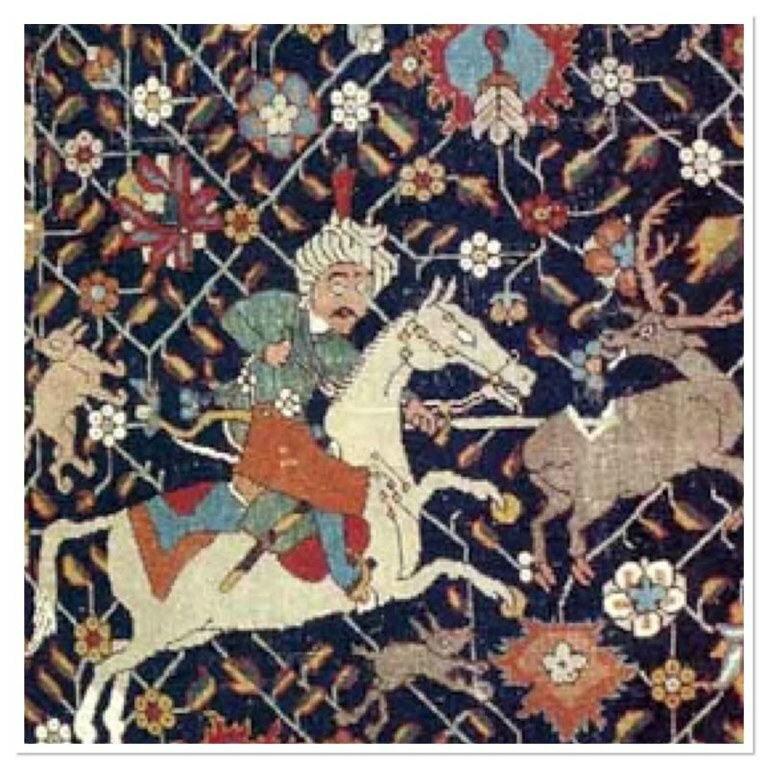 Horses were often featured in the Persian carpets as is evident in the Pazyryk carpet (oldest remaining piled carpet), but during the Islamic invasion of Persia the portrayal of humans and animals in art was forbidden. It would only again be revived by the Safavid rulers who were keen patrons of the arts and requested the great master weavers to create carpets that depicted the royal horses, hunters and sportsmen on horseback. Polo was a game used to prepare soldiers for combat and was a great source of entertainment together with hunting. 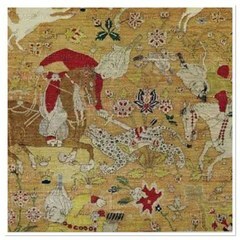 It is often depicted in carpets and miniature paintings of the time. Today hunting carpets are still produced mainly in Isfahan, Iran, and because of the fine detail required they are mostly woven with silk. Horse blankets and saddlebags are also still produced albeit mostly for the owner’s own use. Pictured here is an antique Kurd Khorasan saddlebag in the Ghorbany Private Collection. 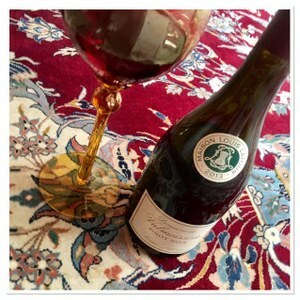 Persian carpets and Wine. Two cultures that have stimulated our senses through thousands of years. One stimulates our senses of sight and touch, the other our senses of taste and smell, but both also stimulate our sense of hearing because in both there is a symphony playing, audible to only those willing to hear. We know that wine is very old. The first thing Noah did after he landed on Mount Ararat and the waters subsided was to plant a vine and make wine. Move on a few millennia and we have Joseph in jail with the baker and the wine pourer (sommelier) of the Pharaoh. There are many other Biblical accounts on the use and importance of wine and it is so suitable then that the earliest wine makers to meticulously document their art, were the monks toiling the lands of the monasteries and making really good wine that they eventually sold. We know the weaving industry is very old, from textiles to carpets. The nomads needed tents, bedding and clothing and weaving was developed to fulfil these needs. What then make these two cultures survive through time? Well, it is exactly TIME that gives it its longevity. Few items become better with time and these two cultures produce exactly such products that can only really be appreciated with the passing of time. There is some magical alchemy that happens when the grape leaves the vineyard and enters the barrel. The process of fermentation with the help of time transforms it into a liquid that captures the aromas and energies of the place in which it grows and ages. The same magical alchemy happens when the weaver takes each strain of meticulously dyed wool to create a whole masterpiece with each woven knot and it is only with the passing of time that the colours will settle into the intended colouring of the wool dyer. If you could ever have a picture made of what a good old wine tastes like, there is no doubt that a Persian carpet would be it. The complexity of colour and design matches the complexity of flavours and aromas in a wine. Just as every bottle of wine holds its little secrets in the flavours, a Persian carpets holds its little secrets in the woven pattern that can be read like an old manuscript by those who know the language. 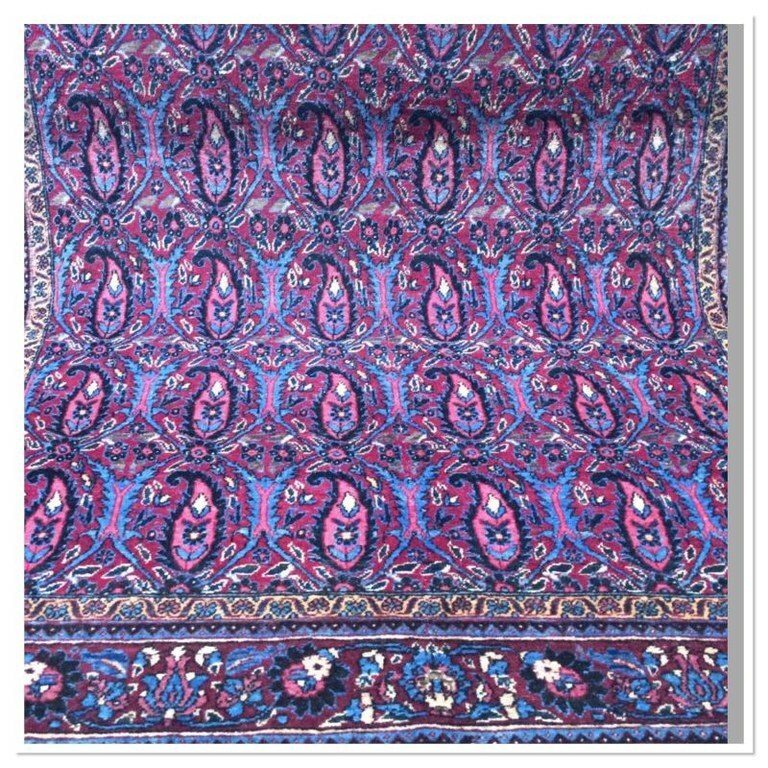 The great difference between them is that when you open that bottle of wine and drank it, the taste and flavours can only live on in your memory; but a Persian carpet can be felt and touched and looked at for generations. It seems as if an invisible power helps both these cultures survive and evolve through wars, invasions and changes of mankind, sometimes even pushed to the brink of extinction. That is possibly its’ greatest magic: that the people who make it come and go, but the art of transforming a grape into wine and wool into a Persian carpet survives from generation to generation, thanks to the farmers and weavers who pass on their skills. It links past with present, it transports us back to that exact moment when the wine maker dreamed of what this wine would become and the weaver envisioned cutting his completed carpet off the loom. Once the bug has bitten you, you will never get enough of either. The thirst for knowledge on it and the almost quasi-religious experience both gives you is what eventually turns a consumer into a collector, and a collector into a treasurer.